Click on the image, so you can see it full size. Reading is fun! I would rip on the text’s lack of readability…but I guess that’s why these guys went into hacking, and not web design. 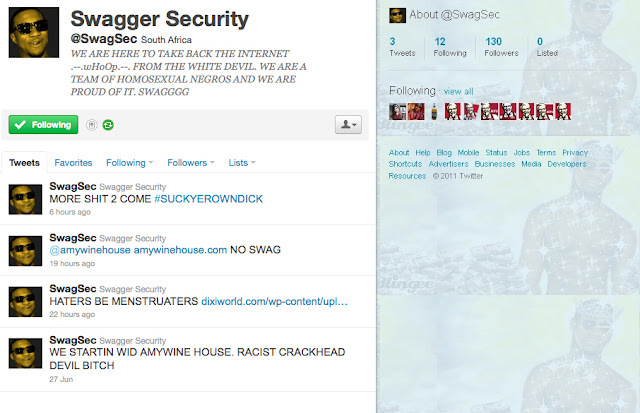 Please notice that @SwagSec is following 12 people, two-thirds of which are accounts associated with KFC. Nice. 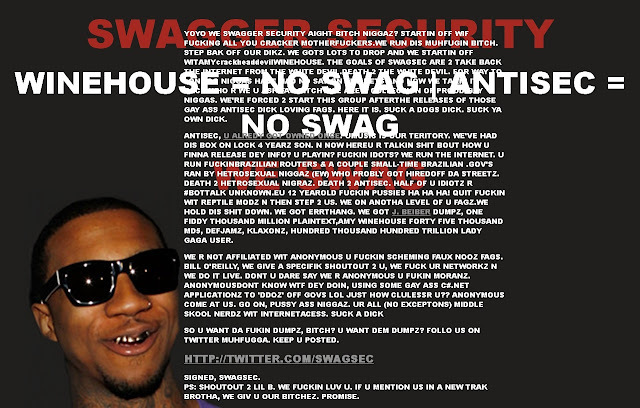 UPDATE: KFC has blocked @SwagSec on Twitter. What idiots. They’re really missing out on a great opportunity for publicity. SMH. SMFH. Yeah, I censored. And yeah, I retweeted. ‹ Lindsay Lohan’s House Arrest Sentence Ends — LiLo Is A Free Woman! 1 Pings/Trackbacks for "Amy Winehouse’s Website Gets Hacked… Big Time"
Lindsay Lohan’s House Arrest Sentence Ends — LiLo Is A Free Woman!